Below is a schedule of the informal LASP Magnetospheres Seminars for the Fall 2008 semester. Except where noted, seminars will be held on Tuesday afternoons in room LSTB-206 at 3:30 pm. LASP holds a series of informal seminars focused on space physics and plasma research relating to the magnetospheres of Earth and other planets. The intended audience is space and planetary physics researchers in the Boulder area, although in most instances any interested persons are welcome to attend. Abstract: For those interested in further details on this topic, please see their recent August 2008 publication in Phys. Rev. Lett. : Ergun, R.E., D.M. Malaspina, et al. (2008), Eigenmode structure in solar-wind Langmuir waves, Phys. Rev. Lett., 101, doi:10.1103/PhysRevLett.101.051101. Abstract: Hourly averaged proton temperature, density, and velocity measurements from WIND have been adequately modeled by the normal probability density for the logarithm of these quantities, by Burlaga et. al. 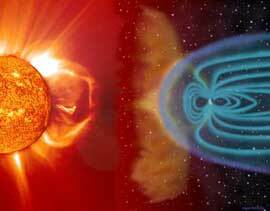 Magnetic Field Strength (Burlaga) and AE Index (Watkins) can be similarly modeled. We have revisited the proton temperature measurements from WIND during 1997 and determined the Autocorrelation function (ACF). The ACF is used to determine the probability of duration above a (user specified) threshold temperature. Historic temperature time series for 1997 and later is used to assess the predictions using the ACF and first passage time theory. This method will be applied to proton and (four second ) electron temperature measurements from Cluster taken in the solar wind. These methods can be extended to density, velocity, magnetic field strength, AE, etc. September 30, 2008 How well does radial diffusion describe transport in the radiation belts? Abstract: The first portion of this talk will cover the results from our recently submitted JGR paper addressing the statistical relationship between energetic (~40 keV) plasma sheet electrons and the solar wind, as well as >2 MeV geosynchronous electrons. Data are taken from Cluster, Geotail, ACE, and GOES-10. Statistically, plasma sheet electron flux variations are compared to solar wind velocity, density, dynamic pressure, IMF Bz, and solar wind energetic electrons, as well as >2 MeV electrons at geosynchronous orbit. Several new results are revealed: 1) there is a strong positive correlation between energetic plasma sheet electrons and solar wind velocity; 2) this correlation is valid throughout the plasma sheet and extends to distances of XGSM=-60 RE; 3) there is evidence of a weak negative correlation between energetic plasma sheet electrons and solar wind density; 4) energetic plasma sheet electrons are enhanced during times of southward interplanetary magnetic field (IMF); 5) there is no clear correlation between energetic plasma sheet electrons and solar wind electrons of comparable energies; and 6) there is a strong correlation between energetic electrons (>38 keV) in the plasma sheet and >2 MeV electrons at geosynchronous orbit measured 2 days later. In addition, preliminary results from current work will be shown addressing the question ‘How quickly can the plasma sheet empty/fill itself with energetic electrons?’. Abstract: Determining how much energy is transported into the magnetosphere during different types of activity and how it is distributed and used in the system are difficult questions to answer with direct observations. I will review how we have been attacking this problem on several frontiers in Helsinki. We started the work about 10 years ago in a classical way using various proxies to determine the energy output in the ionosphere and inner magnetosphere and comparing the results with empirical energy coupling functions based on solar wind data. The next step was to employ the global magnetosphere-ionosphere MHD-based simulation tool at FMI, GUMICS-4, for quantitative studies of the energy transfer and comparisons with actual substorm and storm events. Recently we invested a significant effort in studies of energy conversion using of Poynting vector divergence calculations based on simulation output. In the near future we will attempt to use Cluster observations on the magnetopause to benchmark our simulation results on energy transfer. This is a part of a new 5-year project QuESpace (Quantifying Energy Circulation in Space Plasma; PI Minna Palmroth) supported by the newly-established European Research Council. Within this project we will be able to invest more resources to further development and applications of our present magnetosphere-ionosphere simulation package and begin developing own Vlasov simulations for magnetospheric investigations. October 21, 2008 Themis observations: what are electron phase space holes, where can they be found, and where does rapid reconfiguration of the magnetosphere occur? Abstract: Pluto’s low gravity implies that the atmosphere is only weakly bound and significant hydrodynamic outflow can exist. Though surface spectroscopy of Pluto has revealed methane frost, the dominant escaping neutral gas is thought to be N_2. These escaping neutrals are photoionized and the heavy ions (N_2^+) move away from Pluto in the direction perpendicular to the solar wind flow (i.e. nearly unmagnetized relative to the length scales of the plasma interaction region). The turning distance of the solarwind protons at the magnetic pileup boundary is large compared to the interaction region. As a result, large ion gyroradius affects determine Pluto’s highly asymmetric interaction with the solar wind. We use a three-dimensional hybrid code (fluid electrons, kinetic ions) to investigate the geometry of the interaction region for a variety of possible atmospheric escape rates in anticipation of the New Horizons encounter with Pluto. We find considerable structuring in the wake region due to bi-ion waves and Kelvin-Helmholtz waves. The shock structures vary from a simple Mach cone for low escape rates (~2×10^26 s^-1) to a full detached bow shock for large escape rates (~2×10^28 s^-1). November 11, 2008 Jupiter-related talk entitled, "Acceleration processes above the Io foot print"